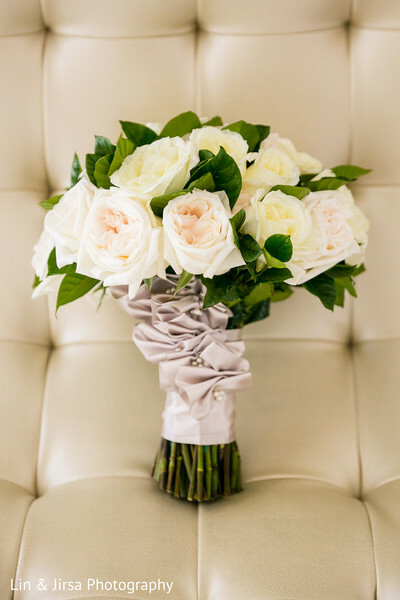 Dear Maharanis, three words come to mind when describing Rayma & Asim's festivities - chic, fresh, and breathtaking. The wedding, which took place at the stunning Paséa Hotel & Spa, and photographed by Jin & Lirsa Photography, was a perfect blend of traditional customs with a modern aesthetic. It is obvious that the gorgeous couple have a fabulous sense of style, and this wedding was perfectly designed and curated from beginning to end. 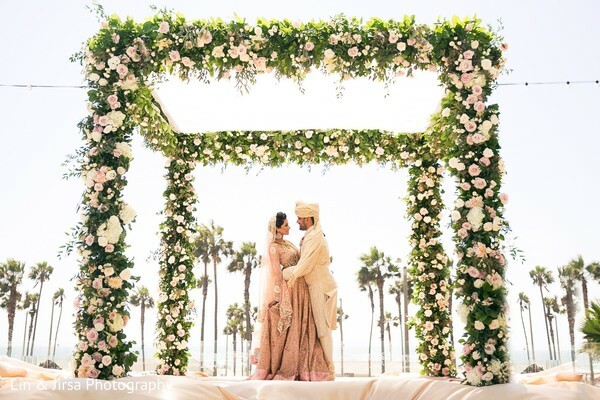 Details Details was in charge of planning/design, while Bloom Box Designs designed the decor and florals beautifully, including creating a magnificent mandap with pillars covered in lush pink and champagne-hued roses! 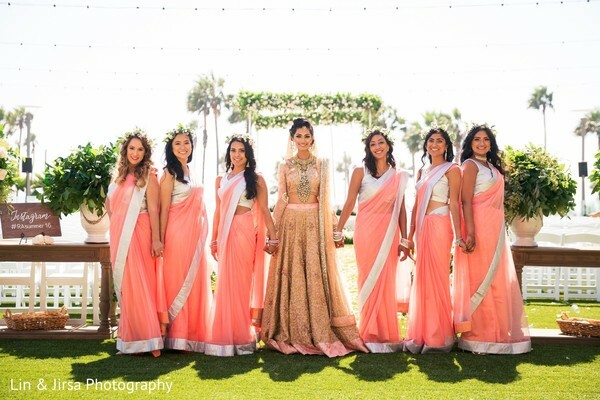 We also have to talk about the stunningly beautiful bride, Rayma, who wore a variety of fashion-forward ensembles in glittery, yet neutral hues perfect for a SoCal beach wedding. 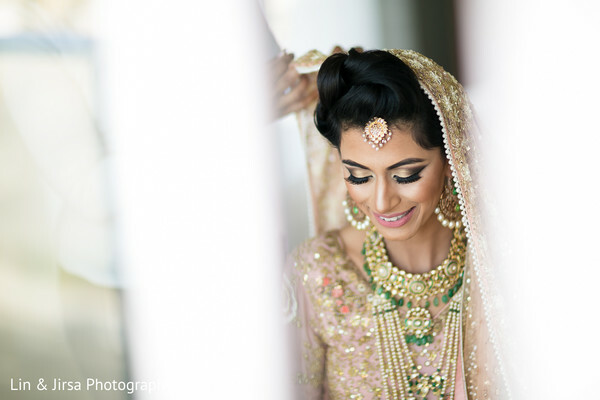 Her ceremony hair and makeup was expertly done by Anaa K and Beauty By NG Nida Gazi, and her reception hair and makeup was done by Beauty of Linda. She looked like a queen gliding down the aisle to the mandap, and her handsome groom looked elated at his first glimpse of Rayma! 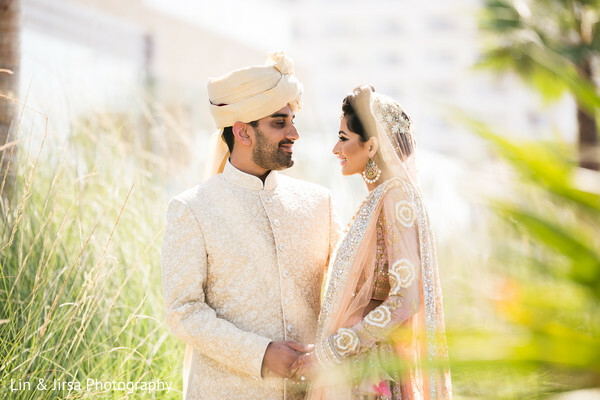 With the stunning ocean backdrop, lush decor, and music provided by 3D Sounds, Rayma & Asim's ceremony was a truly romantic, glamorous experience! We will be bringing you more from the couple's reception later today. 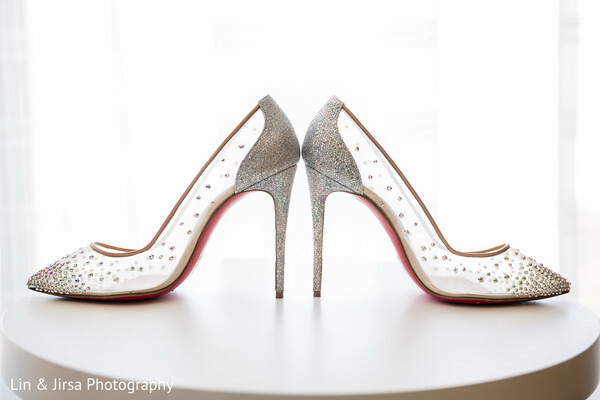 In the meantime, check out their complete wedding gallery below! 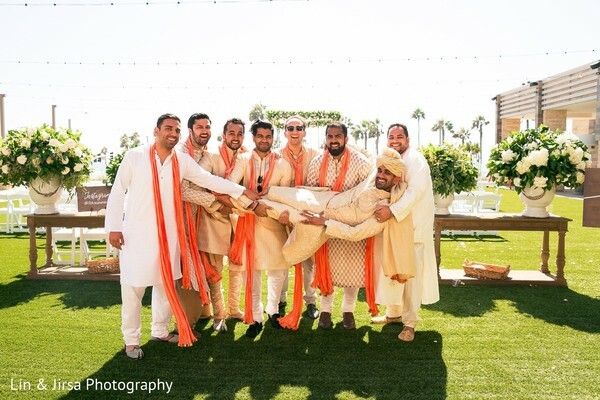 Ramya & Asim's wedding in Huntington Beach had all the perfect elements of a dream Summer wedding! 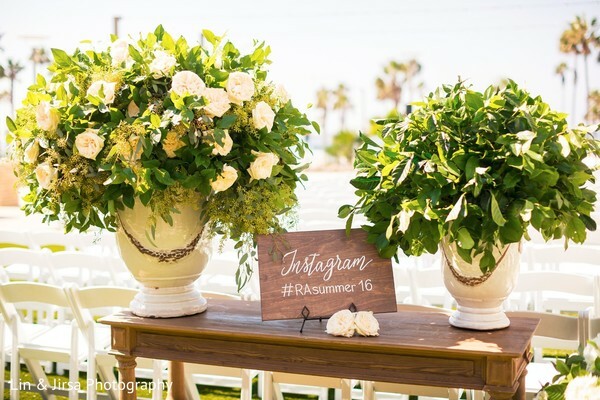 The stunning decor and florals by Bloombox Designs really brought the couple's vision to the next level. This wedding is particularly interesting because Ramya & Asim booked their wedding venue before the venue's construction was even complete! 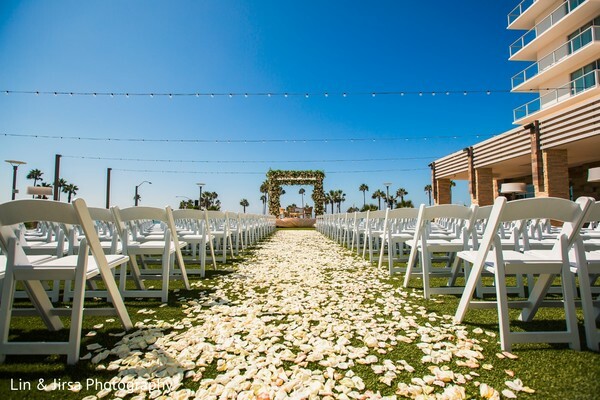 All in all, the couple is in love, the details were fabulous and the perfect Southern California sunshine just made this wedding a complete and utter luxurious wedding dream! 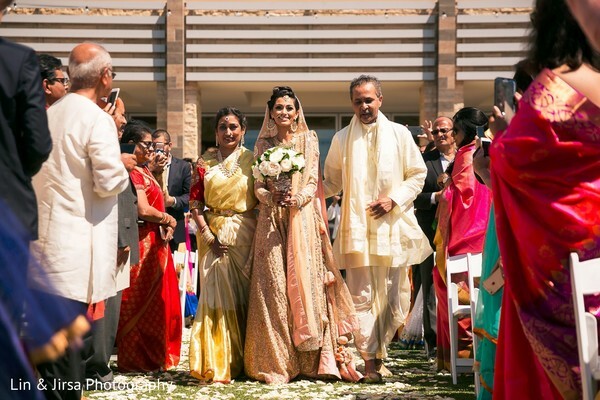 Check back later this morning Maharanis, for more from Rayma & Asim's chic reception event! Beauty By NG Nida Gazi, 3D Sounds, Pasea Hotel & Spa and Manohars Delhi Palace are members of the Platinum Guide. Love what you see? Explore their portfolios.